Senate Republicans' legislation to overhaul the Affordable Care Act would leave an additional 22 million people without health care coverage over the next decade and cut the federal deficit by $321 billion, according to a Congressional Budget Office analysis released late Monday. By 2026, an estimated 49 million people would be uninsured, compared with about 28 million who would lack coverage under current law. More than 260 facilities have chosen to utilize ACMA's Compare Benchmarking service, which tracks delays and readmissions using standardized code sets and compares aggregate performance against similar hospitals. Subscription to the service includes staff education, competency tests, national benchmarking comparison, monthly and quarterly reports, executive findings and strategies for improvement. You've heard that this popular online learning system is ideal both for onboarding new staff members and for annual competency training. You've been told that it features two comprehensive course libraries — one for Case Managers and one for Physician Advisors. You've read that content is developed and maintained by an interdisciplinary taskforce of Case Management and Physician Advisor leaders, is professionally presented by live hosts, and includes interactive case studies and competency quizzes. Now it's time to see it for yourself. 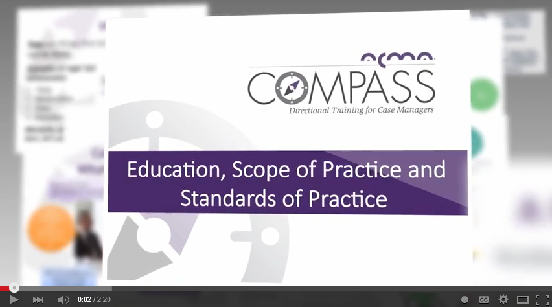 Watch this Compass informational video to see what this powerful training program can do for you and your team. Request a demo by contacting ACMA at productsales@acmaweb.org or calling (501) 907-2262. Senate Republicans rolled out their health care plan, and within hours the bill was already on shaky ground. Republicans can only afford to lose two of their 52 senators for the bill to pass. The Centers for Medicare & Medicaid Services has unveiled a proposed rule that updates the Medicare physician payment system implemented under MACRA with changes to make it easier for small independent and rural practices to participate. The 1,058-page proposed rule, published in the Federal Register, aims to increase flexibility and reduce the burden on doctors and other clinicians by simplifying reporting requirements and offering support for them in 2018, the second year of the Medicare Access and CHIP Reauthorization Act (MACRA). In the quest to achieve the Triple Aim, many organizations adopt new strategies that they hope will improve the delivery of care. But just because an innovation worked at one hospital doesn't mean that it will be a success at yours, says Cindy Brach, a senior healthcare researcher at the Agency for Healthcare Research and Quality, in a blog post for Health Affairs. Having long decried the failings of the Affordable Care Act, Senate Republicans are purporting to fix one of its loopholes with their newly unveiled health plan. The so-called coverage gap left more than 2.5 million people living below the poverty line of $11,880 for an individual ineligible for Medicaid or financial assistance to buy insurance — even as higher earners got subsidy checks to buy theirs. But experts say the fix, which looks fine on paper, is a mirage. A new study in the journal Health Affairs shows that, despite being designed to more effectively manage care and control costs, black patients enrolled with Medicare Advantage are far more likely to be readmitted to the hospital after a surgery than those enrolled on traditional Medicare. Furthermore, significant disparities continue to exist in readmission rate between black and white Medicare patients. "Our findings suggest that the risk-reduction strategies adopted by Medicare Advantage plans have not succeeded in lowering the markedly higher rates of readmission for black patients compared to white patients," said Yue Li, Ph.D. an associate professor in the University of Rochester Medical Center (URMC) Department of Public Health Sciences and lead author of the study.